I hope you have a good memorial day. Thank you to those who have served. And my usual blog: It’s one thing to leave things about decoratively, it’s another to be messy about it. Also, I have news. Great news! You won’t believe it!!!! There will be more Little Dee. 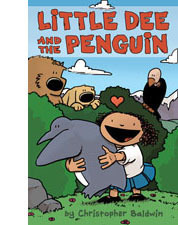 Penguin/Dial books will be publishing my comic strip “Little Dee” as a 120 page full graphic novel! I’ll be writing, drawing, and coloring it, and it’s due out in about a year or so. I’m very excited about this, what fun! Hoopla! I hope you remind us when it comes out and how to get it. The reminder is the thing. These days I can forget why I went into a room. Thanks y’all! I’m so excited about it. that is FABULOUS news!! Yay!!! Wonderful news!!!!! Thanks for those of us who aren’t SpaceTrawler fans. Awesome!!!!!!! I can hardly wait for more Dee! I’m thrilled by your news. I’ll definitely be in line for your book.